I have been eyeing this old trike in a local antique store for a few weeks now. I fell in love with it right away. (I have a flare for the dramatics). So after going back and forth about buying it.. I took the plunge this weekend and bought it. It’s circa 1920’s, and I can just imagine all the little kids that have made memories on it. Love the simplicity of this photo. The light is perfect! 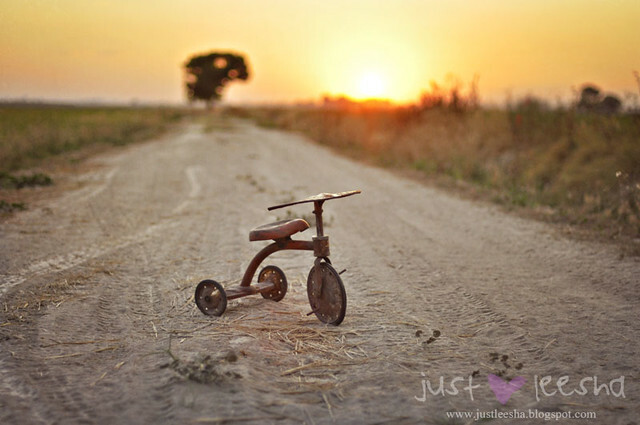 It is a beautiful trike and a beautiful shot. Brilliant photo – the way you’ve captured it, you can almost see little people on the bike from generations ago. I’ve seen your photos in various challenges/link ups but this is the first time I’ve looked through some previous posts on your blog. And what a pleasure it’s been – your photography is just wonderful, I really like your style and your commentary. Thank you, your work is very inspiring. Great photo! I’m with you there is something special about something so old. If that trike could talk I’m sure it would have many fun stories to tell! Wow! I love it! I can’t believe how old it is. Awesome! that is an adorable find! My dad had one from when he was little…God knows who had it before him! I love things with history!!! Just for this shot it was worth your purchase. And yes, I am sure it hold beautiful stories and you just added one more! The composition of this shot is great! I love it!